GB Boxing’s newly appointed world class performance coach, Tony Davis, was honoured at the St John Ambulance, Everyday Heroes awards. The annual event which recognises life savers and first aid champions was held at the Hilton London Bankside yesterday evening. The ceremony’s aim is to shine a spotlight on the inspirational stories of ordinary people who have used first aid to save a life, or who have inspired others by their bravery. 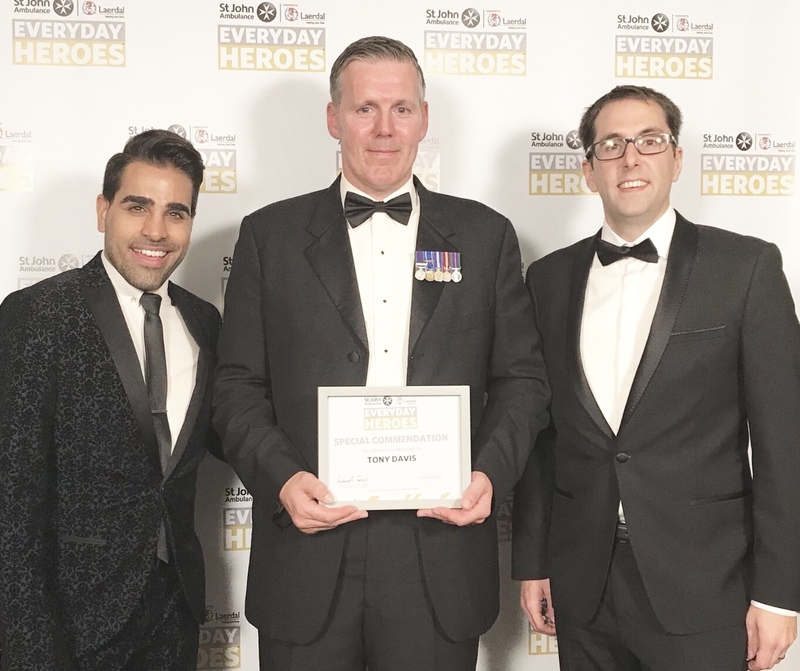 Tony received a Special Commendation to thank him for the bravery that he showed on the day of the Westminster Terror Attack, where he was the first person to reach the wounded officer, PC Keith Palmer. Tony jumped a fence to reach the injured officer and began performing CPR before Tobias Ellwood MP took over. Sadly, Keith Palmer’s life could not be saved but both men were awarded for their incredible bravery. It was his knowledge in basic first aid that Tony used to attend to the officer, he applied pressure to the victim’s wounds before he was joined by MP Tobias Ellwood and the medical team. Since the attack took place and through the stories of how Tony’s basic first aid was used at the scene, St John Ambulance have seen a surge in members of the public contacting them and wanting to learn basic first aid skills. The recognition marks a momentous year for Tony, who became a fulltime GB coach in July 2017. He will now join fellow GB coaches Lee Pullen, Dave Alloway, Paul Walmsley, Gary Hale, Mark Geraghty and Bob Dillon as a world class performance coach, on the GB Boxing Olympic programme. Tony who once boxed for England, has over two decades experience in the British Army. Whilst in the Army, his passion for boxing continued where he coached the Army boxing team, alongside his role as the Head of Physical Development. In 2013 he became a part-time performance coach, mixing his work for GB Boxing alongside his work with the army.